This Best of the Maldives piece is possibly my most archetypal. 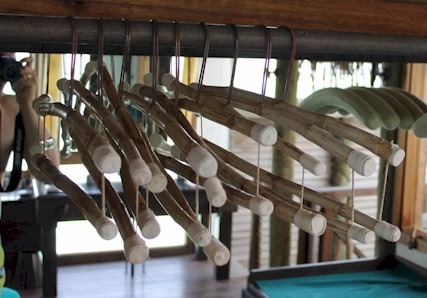 I say that because when I am describing to people the extent of the esoterica that I investigate and write about I often cite the “Clothes Hangers” example. These are the sort of obscure distinctions that I adore. They are the subtle details that some resort designer or marketer has been inspired to provide. As wood is the traditional gift for the 5th anniversary, I thought that today would be an appropriate occasion to finally post this distinction that I have mentioned in conversation so many times. Clothes hangers are a fine example of a pedestrian item that can be made colourful and remarkable with a little creativity and panache. I’ve seen painted hangers, padded and scented ones, but nearly all of our hangers at home are wood. I’ve seen other wooden ones in the Maldives, but none quite a funky and fun as Gili Lankanfushi’s bamboo collection.